Every decade has its memorable style. Some are fantastic and leave us wishing to bring those eras back. Others… not so much. The bright rainbow legwarmers of the ‘80s might be a thing we can let go… maybe. And, rumors are that Disco is long dead, despite several efforts to bring it back into the modern day. There is certainly something to the ‘70s and the groovy style that it had to offer, just like the ‘60s and its flower power peace and love. But, there is something about the decade even before that which warms the heart. The retro look, the joy that came from simple pleasures, the perfectly pleasant atmosphere of the suburban life. Of course, there were a number of problems. We weren’t all seen as equal and there are obvious benefits to the modern day conveniences. Who can argue with having access to almost all the world’s information at the touch of a smart screen!? But, that is where the magic of modernity allows for us to have both at once! Remain in the present but draw forward the nifty looks of the swell 1950’s in this Nifty 50’s Costume. It is a great way to celebrate all things retro with this interlock knit dress. 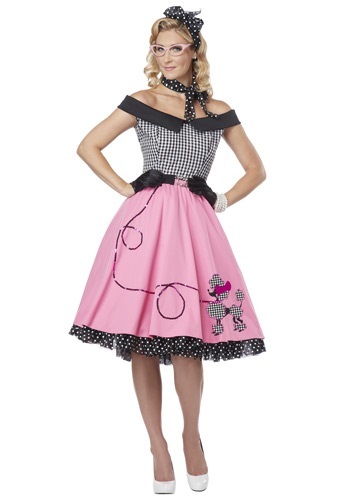 Its black and white gingham print bodice and off-shoulder neckline brings back the days of the ice cream parlor and checkerboard days while the pink poodle skirt (with appliquéd sequin leash, just to make sure the doggie doesn’t run off) give you that splendid splash of color. The matching black polka dotted head and neck scarves match the netted hemline of the petticoat and finalize your perfect ‘50s look. Accessorize with the right horn rim glasses and you’ll be perfectly pleasant!